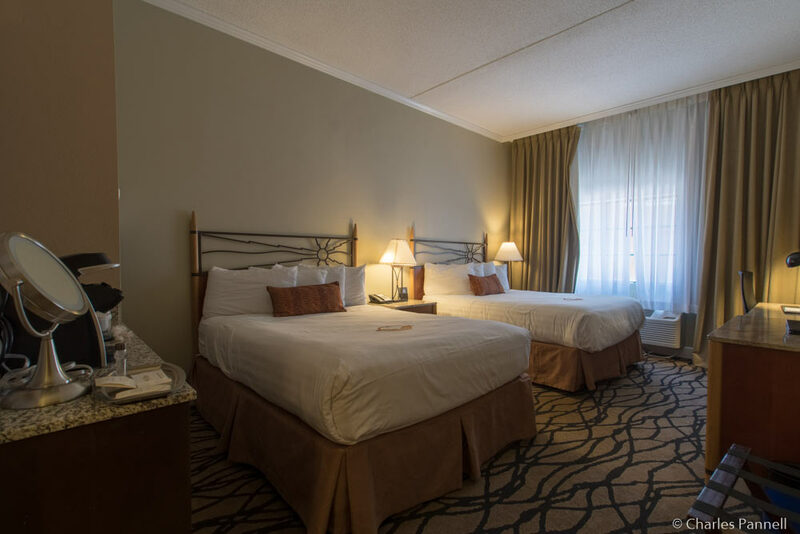 There are a number of lodging choices in and near Grand Canyon National Park; but the Grand Hotel at the Grand Canyon (www.grandcanyongrandhotel.com) is an excellent choice for comfort, convenience and accessibility. 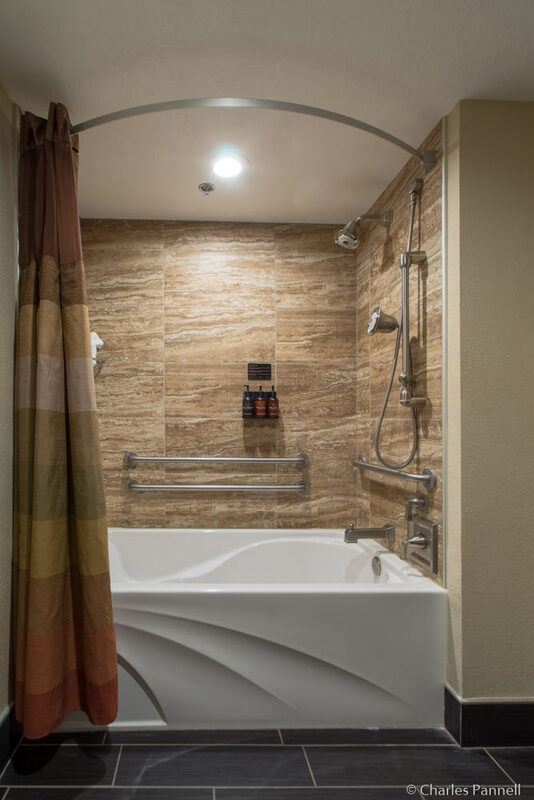 Located just a mile from the park’s South Entrance in Tusayan, the property features seven wheelchair-accessible rooms with either a roll-in shower or a tub/shower combination. Add in a gaggle of helpful hotel employees, and an accessible shuttle to and from the park, and you have the perfect home base for any Grand Canyon visit. This three-diamond property has plenty of accessible parking near the entrance, with barrier-free access through an automatic door to the main lobby. Inside, the spacious lobby is adorned with taxidermy mounts, while a circle of comfortable chairs surrounds the massive stone fireplace. The whole property exudes a distinctive mountain lodge ambiance; and there’s plenty of room to maneuver a wheelchair around the room, and over to the lowered registration desk. Room 133, which is located on the first floor, features wide doorways, a lowered peephole, lever handles, a lowered clothing rod and good pathway access throughout the room. It’s furnished with two 29-inch high queen-sized beds with wheelchair access between them, a night table, a desk with a chair, and a chest of drawers. It’s also equipped with a microwave, a refrigerator and a Keurig coffee maker; and there’s a roll-under sink just outside the bathroom. 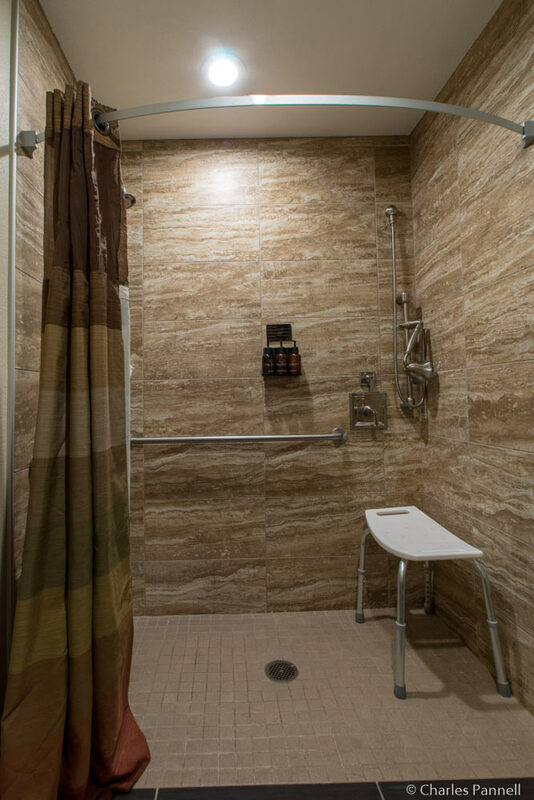 The bathroom features a full five-foot turning radius and is equipped with a roll-in shower with grab bars, a hand-held showerhead and a portable shower bench. 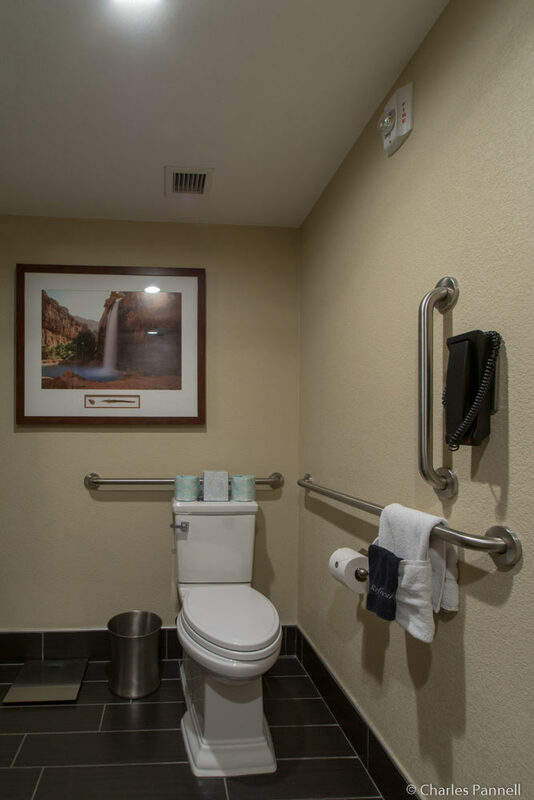 The toilet grab bars are located on the back and left walls (as seated), and the bathroom also includes a lowered hook. 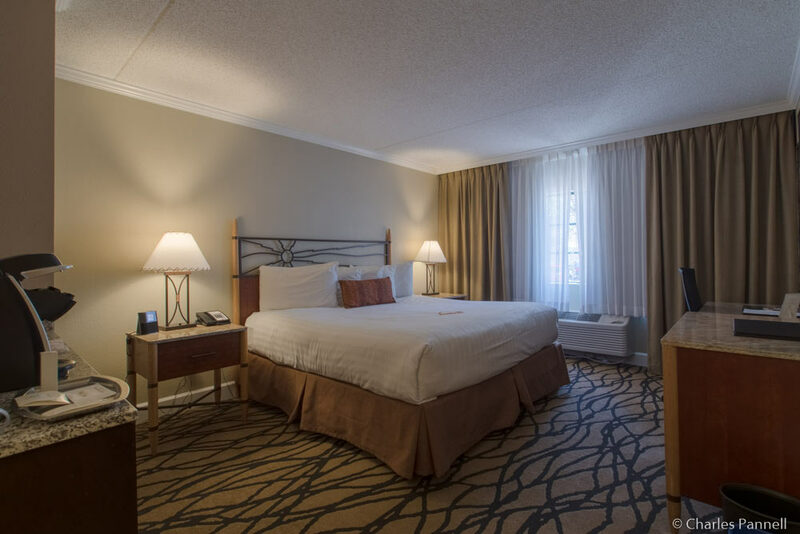 Room 229 features the same general access features and furnishings as room 133, except that it is furnished with a 29-inch high king-sized bed with wheelchair access on both sides. 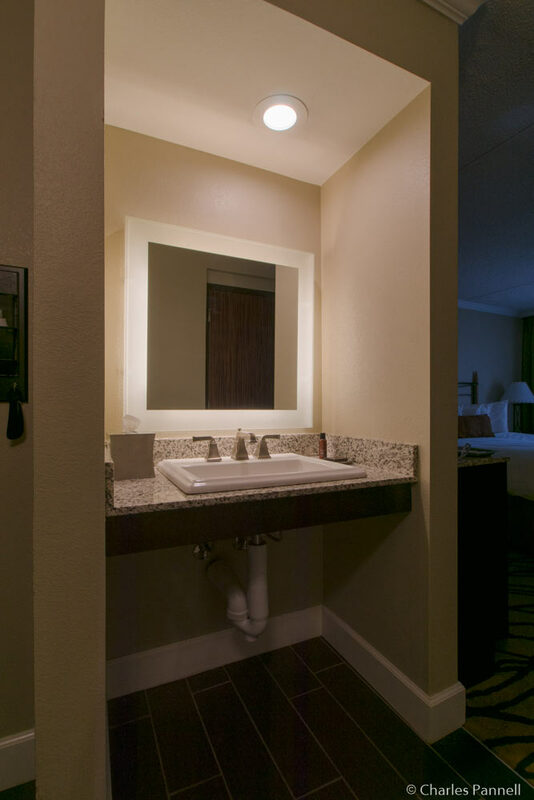 The bathroom is equipped with a tub/shower combination with grab bars and a hand-held showerhead. 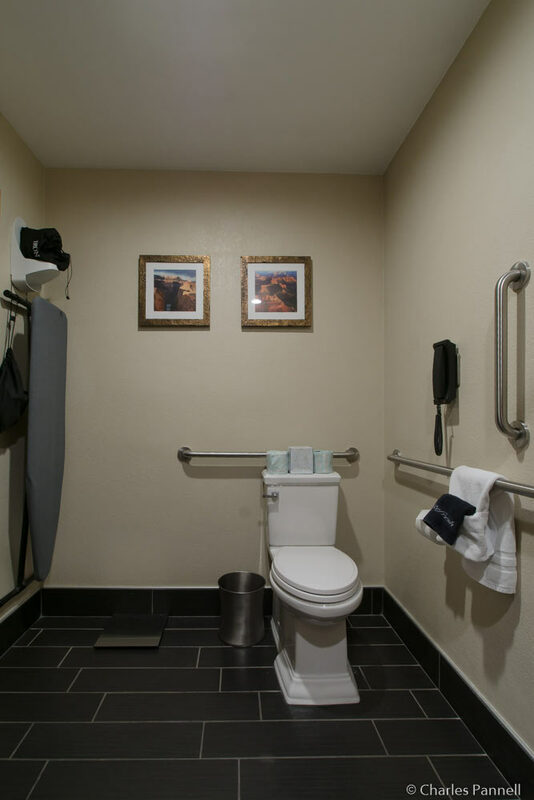 A portable shower chair is available upon request, and the toilet grab bars are located on the back and left walls (as seated). 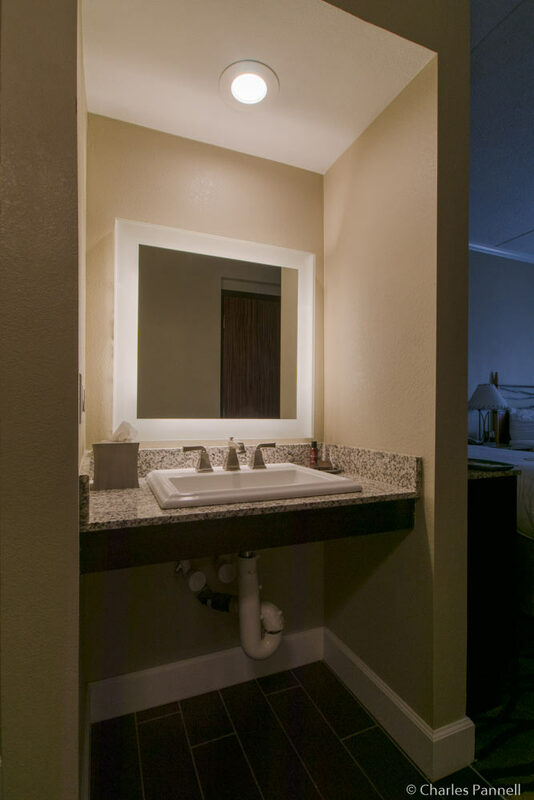 As with room 133, a roll-under sink is located just outside the bathroom. The public areas of the property are equally accessible, with elevator access to all three floors, and barrier-free access to the Canyon Star Steakhouse & Saloon, the gift shop, the fitness center and the business center. There’s also level access to the lift-equipped pool and spa, which are located on the first floor. In short, nothing has been overlooked at this comfortable property. 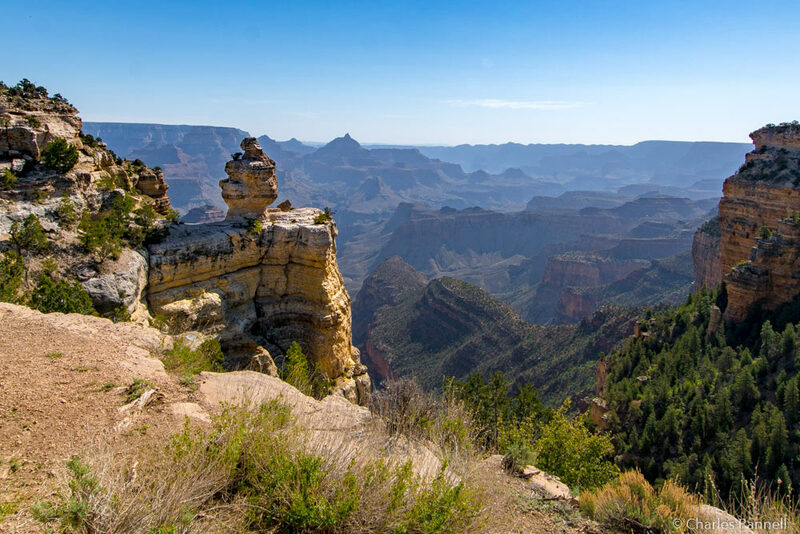 Although you can certainly drive your own vehicle to and from Grand Canyon National Park, it’s much easier and quicker to take the park shuttle. All of the park shuttle buses are ramped or lift-equipped, and they can accommodate wheelchairs up to 30 inches wide and 48 inches long. The shuttle operates from March 1 to September 30; and it stops at the The Grand Hotel at the Grand Canyon and the Tusayan Imax Theater, and transports passengers to the Grand Canyon Visitor Center on the South Rim. Once inside the park visitors can connect to other shuttle routes, or just enjoy an accessible stroll along the canyon rim. And although there’s no charge to ride the Tusayan shuttle bus, visitors must show a park pass or an entrance receipt in order to board the bus. As an added bonus, the shuttle bypasses the long lines at the park entrance. An in-depth look at some of the park’s top attractions is also offered on a variety of Xanterra bus tours. The Sunrise Tour covers the west end of the park, while the Hermits Rest Tour follows the former wagon road on the east side of the park. The longer Desert View Drive Tour presents an excellent opportunity for carless visitors to get a look at the iconic Desert View Watchtower; and the Sunset Tour concludes with sunset at either Yaki Point or Mohave Point. Advance reservations are required for these tours, and accessible buses are available with 48-hours advance notice. For more information, or to book a tour, call (888) 297-2757 or visit www.grandcanyonlodges.com. Check out the wheelchair-accessible multiuse trail in Bryce Canyon National Park. And don’t miss colorful Kodachrome State Park.